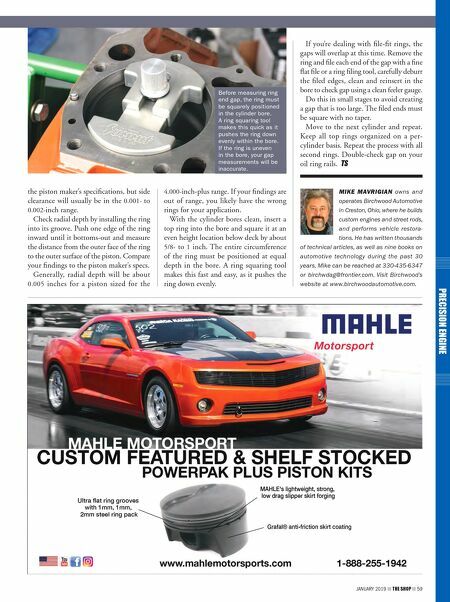 JANUARY 2019 THE SHOP 59 PRECISION ENGINE the piston maker's specifications, but side clearance will usually be in the 0.001- to 0.002-inch range. 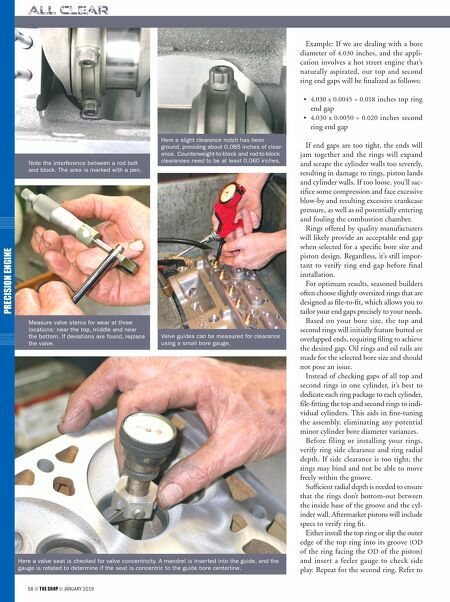 Check radial depth by installing the ring into its groove. Push one edge of the ring inward until it bottoms-out and measure the distance from the outer face of the ring to the outer surface of the piston. Compare your findings to the piston maker's specs. Generally, radial depth will be about 0.005 inches for a piston sized for the 4.000-inch-plus range. If your findings are out of range, you likely have the wrong rings for your application. With the cylinder bores clean, insert a top ring into the bore and square it at an even height location below deck by about 5/8- to 1 inch. The entire circumference of the ring must be positioned at equal depth in the bore. A ring squaring tool makes this fast and easy, as it pushes the ring down evenly. If you're dealing with file-fit rings, the gaps will overlap at this time. Remove the ring and file each end of the gap with a fine flat file or a ring filing tool, carefully deburr the filed edges, clean and reinsert in the bore to check gap using a clean feeler gauge. Do this in small stages to avoid creating a gap that is too large. The filed ends must be square with no taper. Move to the next cylinder and repeat. Keep all top rings organized on a per- cylinder basis. Repeat the process with all second rings. Double-check gap on your oil ring rails. MIKE MAVRIGIAN owns and operates Birchwood Automotive in Creston, Ohio, where he builds custom engines and street rods, and performs vehicle restora - tions. He has written thousands of technical articles, as well as nine books on automotive technology during the past 30 years. Mike can be reached at 330-435-6347 or birchwdag@frontier.com. Visit Birchwood's website at www.birchwoodautomotive.com. Before measuring ring end gap, the ring must be squarely positioned in the cylinder bore. A ring squaring tool makes this quick as it pushes the ring down evenly within the bore. If the ring is uneven in the bore, your gap measurements will be inaccurate.